It's time for another challenge over at Frilly and Funkie. This time Zoe is the hostess and she has chosen the theme "Be My Valentine". Sadly, this will be my last challenge with Frilly and Funkie. I have really enjoyed the two years I have spent as a team member there, but as I'm sure you all know, crafting sometimes has to take a back seat for a while. I'm so thankful to Linda and Jenny for being so supportive over the last two years, what wonderful leaders and amazing artists they both are. I wish them all the best for whatever the future brings them. My landscape photos today were taken here at the lake back in December when we had our first snowfall and our first freeze. I miss the lovely December weather. 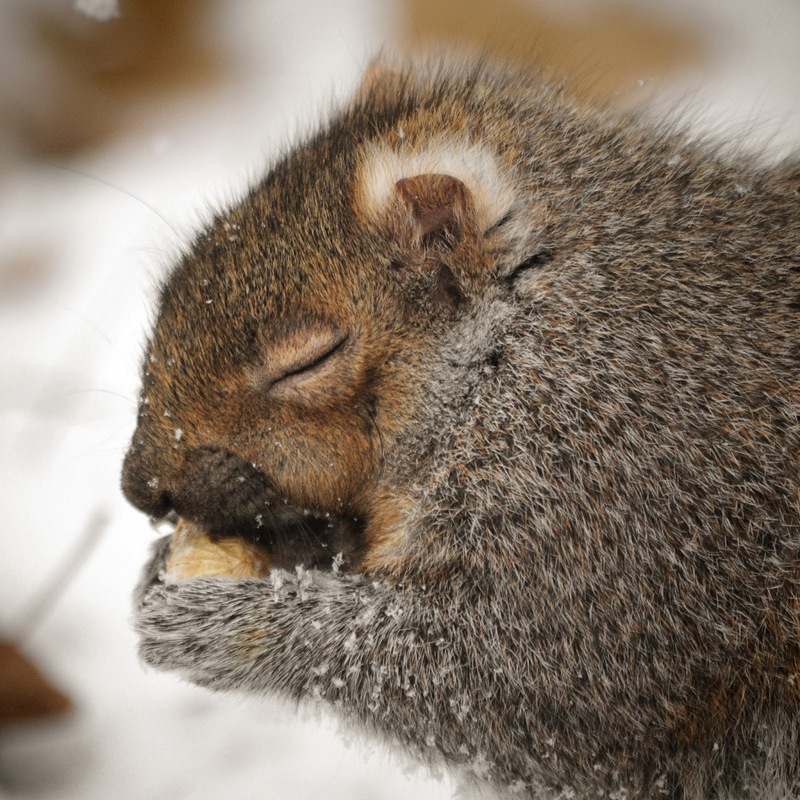 "Winter isn't so bad. You just gotta close your eyes and pretend you're on the beach. Yum, Peanut-Colada! "All I see here are mushrooms and grapes! Pleeeeeease tell me you didn't take peanuts off the menu!" "Hey, what can I say, just living up to my name!" 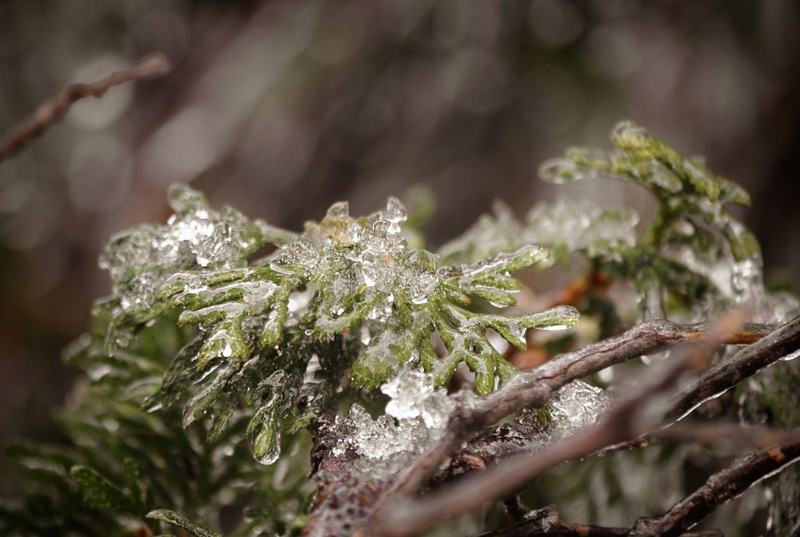 For my macro today, some frozen pine needles from up north. Gorgeous car Love the photos, as always. Have a great month. Hugs, Valeried, they will surely miss you at F & F.
Stunning card with all the wonderful layers and the depth to the card is amazing. Beautiful card!! Love the details you put into your creations and I know you will be missed at F&F. Fabulous shots once agin! Amazing Valentine card, Pamellia! I love the layers unpon layers of beautiful papers, the bit of lace, the pearls and those burlap flowers! Of Course the splash of white just takes this over the top--I'm always afraid to do that! I had a chuckle at the hearts charm; I've included that on mine, too! I can still remember back to the day you started with Frilly and Funkie--how thrilled you were,and I was for YOU! 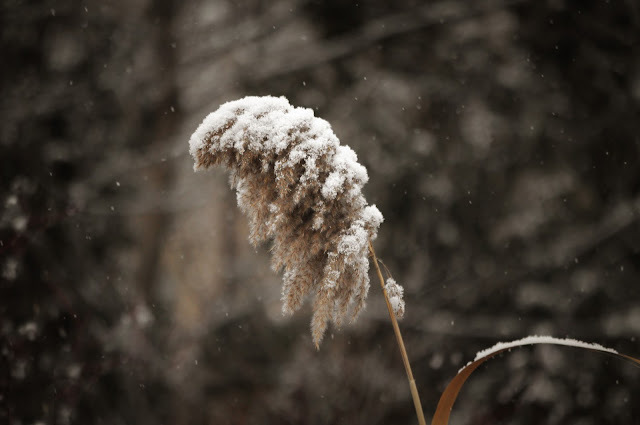 You and your lovely work will be sorely missed on this, one of my favorite blogs! Your photography is amazing! I was looking back at some of your posts from last year (still clearing away some e-mails!) and it is truly amazing how far you have come with your photography skills! I just know you will make it to the top in this profession! Sending you big warm hugs! Your cards are always so amazing and beautiful, Pamellia. Love this one, of course, too! Wonderful photos of your critter friends--always love seeing them! I am so sorry to hear you are not going to be crafting much. I do understand but I will miss seeing your creations. I always look for them first each day--always such a highlight for me! 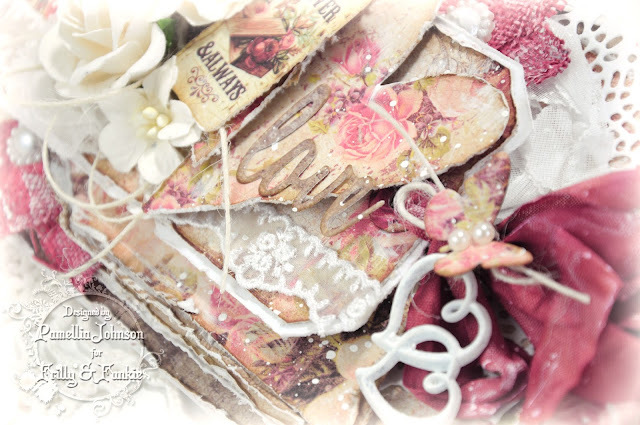 Such a gorgeous Valentine creation, stuffed full of beautiful layers, pretty papers and wonderful elements to captivate us. Your card is simply divine Pamellia!! Love the colours and all the layers of papery goodness, and you always phtograph your projects so beautifully too. Makes it so easy for us to see all those fabulous details! Gorgeous card Pamellia! Love all the fancy embellishments and layers! Just stunning! 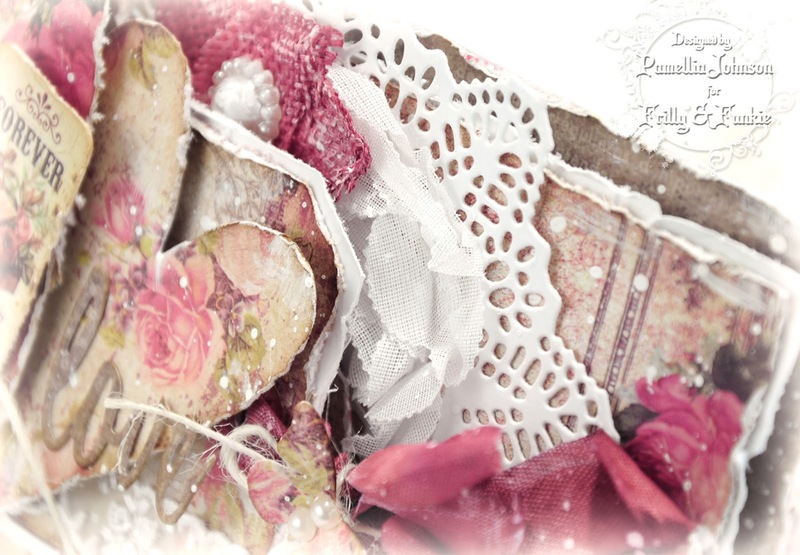 Lovely Valentine's card with all your signature elements - layers, flowers, twine. It is a fun shape and has a nice vintage vibe to go along with all the shabbiness. All the best in your future endeavours. 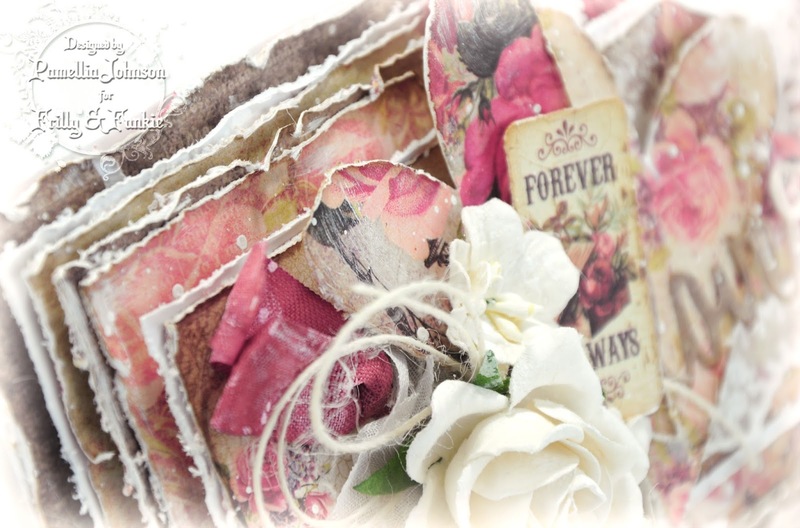 Amazing work Pamellia, beautifully designed and gorgeous layers, I love the colours you've chosen,and all your embellishments. Such a beautiful Valentine's card! Lovely distressed layers and a gorgeous shade of rose. The double heart charm is perfect here and I always love how you alter the bronze charms to white. I have enjoyed having you on the team and always look forward to what you will share with our visitors. You will be sorely missed in our challenge line-ups. Wishing all the best for you going forward. Amazing tones of colours and full of sweet details to look at!Amazing, just amazing my friend! Anyone would receive this card for valentine!! 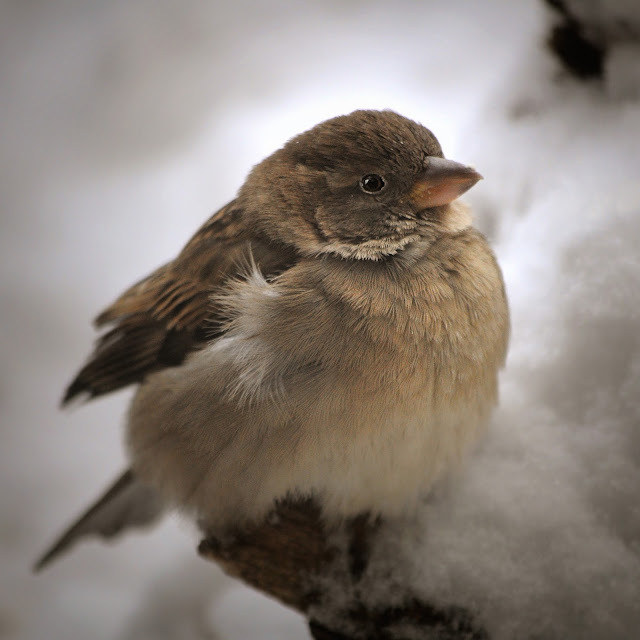 Sweet furry and feathers friends in the snow, your photos always make me stunned, so beautiful!! 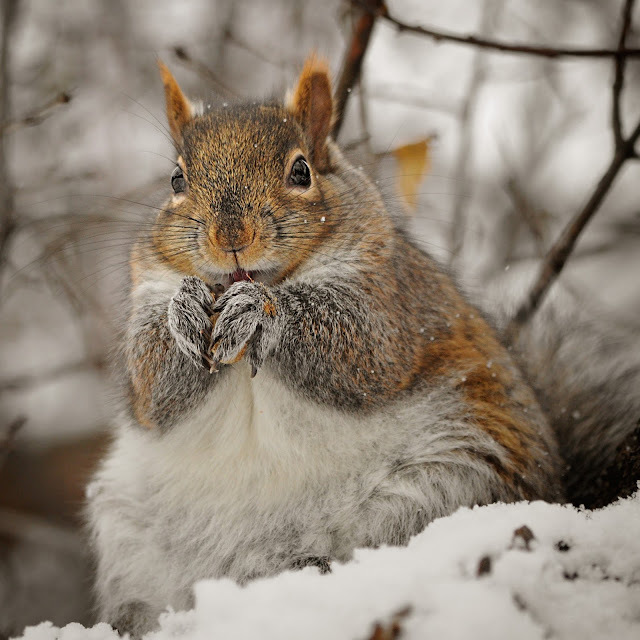 I think that a peanut-colada would be so yummy for that squirrel, you made me laught! 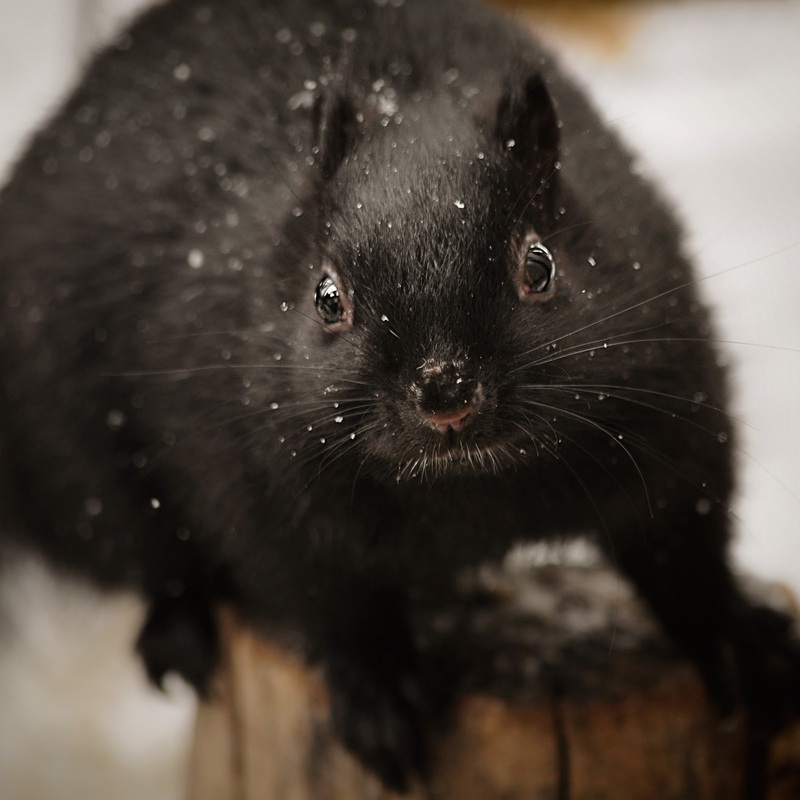 Poor cuties, surely spring will be more lovely for them! Amazing - both - the card and the photos! You never cease to amaze me with your posts! 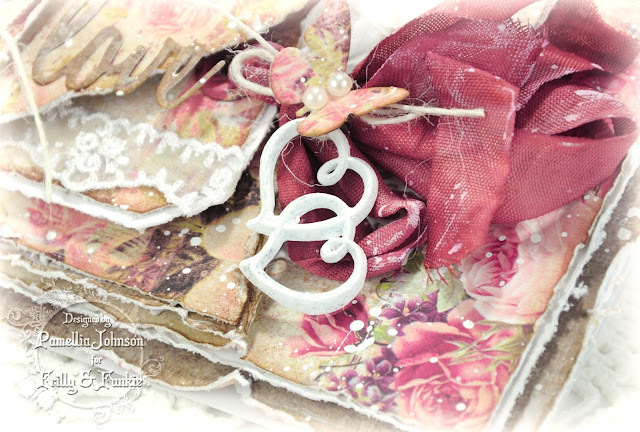 Perfect card for Valentines, so romantic and beautiful, gorgeous layering and details and i love that deep rose colour. 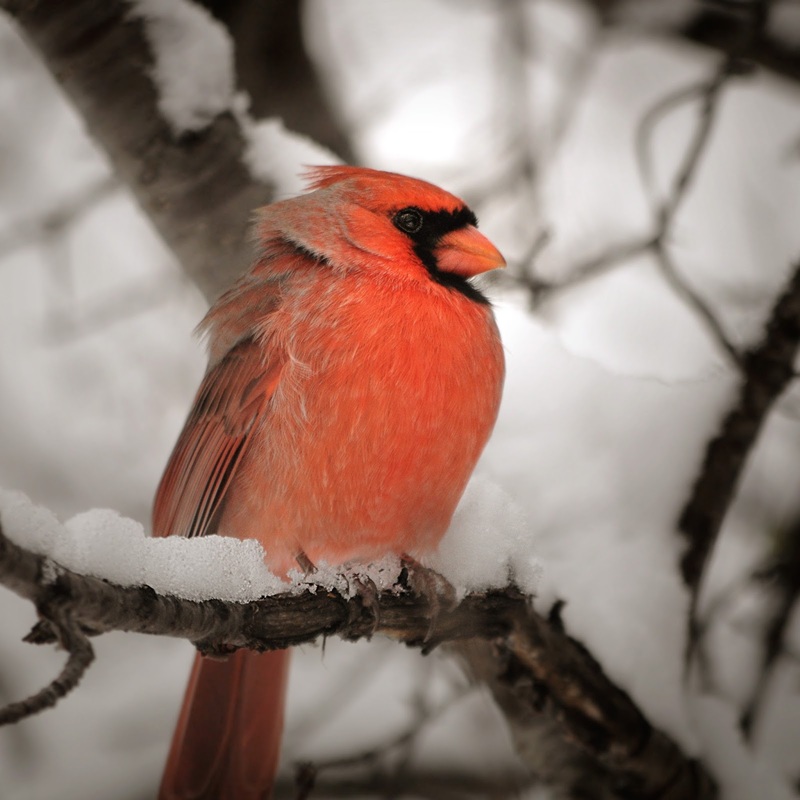 Your photos are wonderful ...love the wintery animal and bird shots with their fluffed up fur and feathers! Swoon!! What an absolutely stunning card, Pamellia!! The layers are amazing!! I truly don't know where to begin because I love, love everything!! The papers and colors are beautiful!! The hearts, the butterflies, the ribbons and laces, everything is spectacular!! This is so romantic and gorgeous and I truly couldn't love it more!! So amazing my friend!! They will truly miss you and F&F!! oh I am so sorry to hear your leaving the Frilly and Funkie challenge DT. I am sure they are going to miss you so much. I love this wonderful Valentines card and your very superb design as usual. Lovely and wonderful elements arranged so beautifully too, and gorgeous papers as always. Yout photos always continue to amaze me as they are so very superb. Your lovely little furry friends are just the sweetest too. I feel so sad that this is your last post for F&F, they will miss you terribly I am sure, but what a way to sign off! 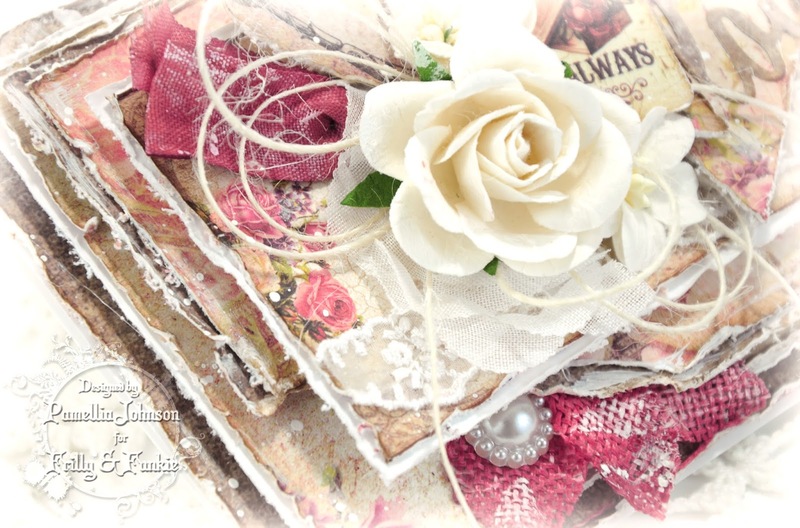 Your card is absolutely stunning, I love all the layers, the beautiful hearts and that lovely white doily in the background. Really, really stunning. 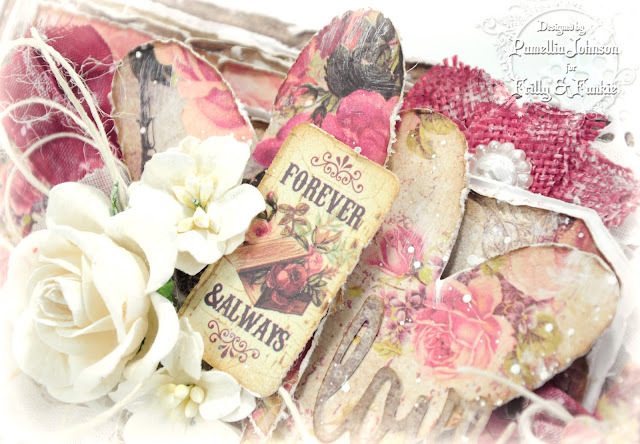 Gorgeous card for Valentines Pamellia, wonderful layers of colors and embellishment, stunning card to finish! sure they will miss your creative makes. Wonderful photo shots you have shared. A beautiful card and post Pamellia, I would say it was good having no snow. What a fabulous card Pamellia - this is so lovely - love the rich red you have used and as ever I am in awe of all your layers. Do hope you will keep crafting and blogging :-). Your photos leave me breathless thanks you for sharing parts of your world. So sad to learn that this will be your last challenge with us, Pamellia. You and your beautiful creations will be missed. Life does, indeed, throw us some curve balls. But when you connect with a curve ball in baseball, it usually means a home run is your reward. I hope that is the case for you. This is such a gorgeous card! Your layering skills always make me think of puff pastry! The color palette is perfection and the lovely details just sing. Wishing you all the best in the future. 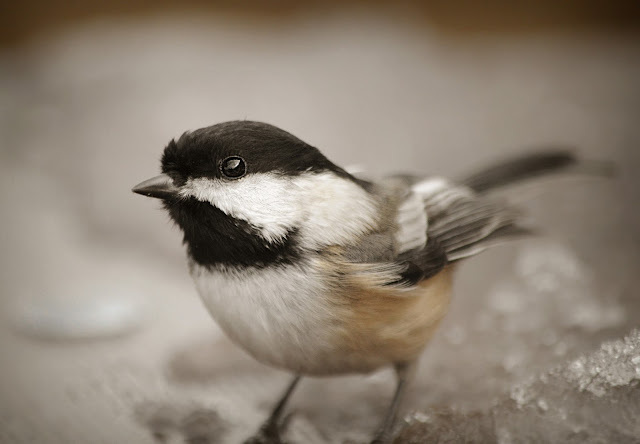 I hope you'll still have time to create and take your lovely wildlife photos. Hugs! A HUGE sigh, for this beautiful card, with, as always, the special details to enhance and show everything off to it's advantage, the most beautiful colours and details. LOVE it. Your nature photos are also something I would love to have a little of your talent in. I suspect Frilly and Funky will miss your beautiful cards. I love that you've named them all...lol...too cute! Now this is a Valentine. Gorgeous layer upon layer. What a beautiful card Pamellia ! Lovely colors so pretty details . 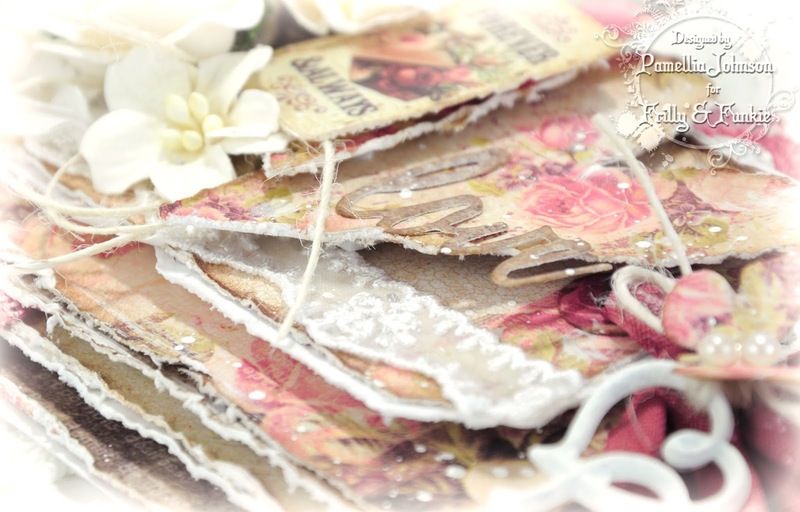 The different patterns and tiny red/white hue variations just make this card stunning Pamellia. Truly a EXQUISITE Valentine. It will be sad not to see your gorgeous work on Frilly and Funky. I know they will miss your creativity very much. Each photo is just perfect. My fav is Tubby Tilly - her colors are amazing. And for sure... Mr. Chub would not qualify for 'Anything But Cute'... he is a CUTIE PIE!!! Xj. Such a beautiful valentine Pamellia! I'm sorry to see you go from Frilly & Funkie, we will miss your shabby chic masterpieces. Wishing you all you wish for in the future. I am sure they will miss the beauty and creative spark you brought to F&F!You have done them proud! Oh how I love your sweet sweet squirrels! and their thoughts you add are right on with their photos- delightful! I've just stumbled across your blog Pamellia and been having a browse - wow you have some beautiful work. Beautiful card Pamellia and I'm sure you will be missed over at Frilly & Funkie. 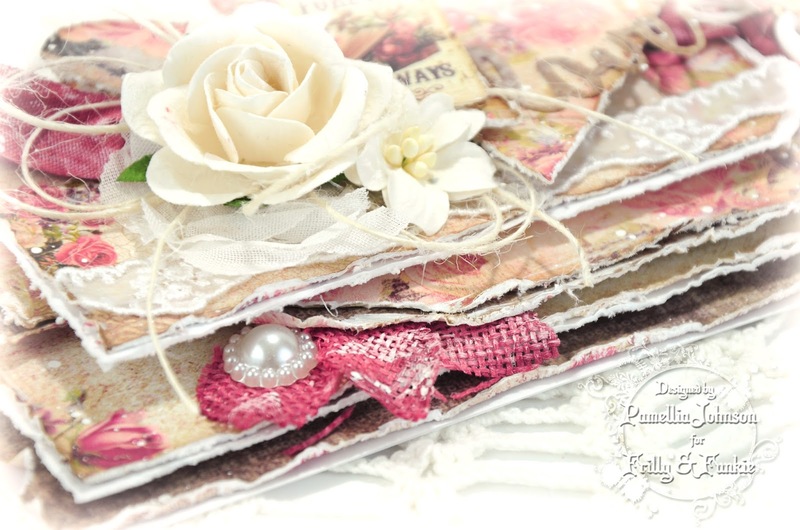 Beautiful Pamellia..the layers and colours, the distressed edges and gorgeous details..just fabulous. Well you certainly went out with a bang for this last post! 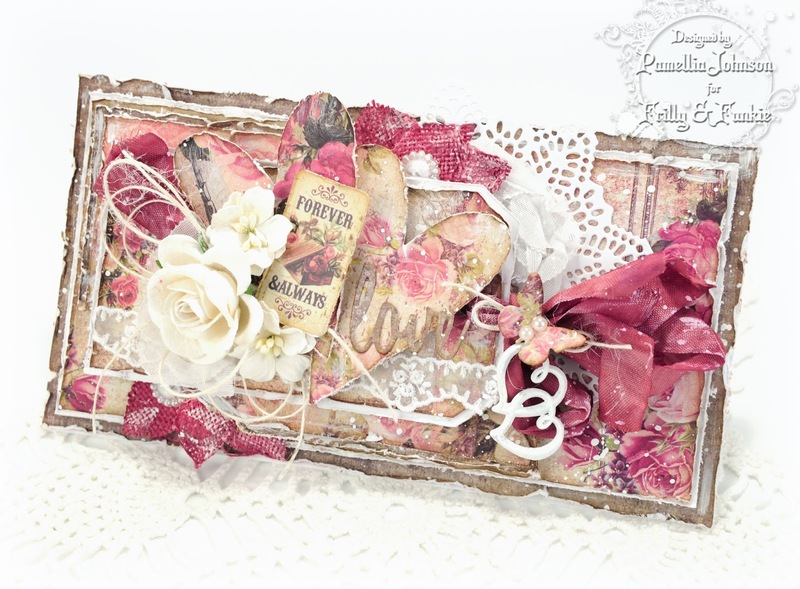 BEAUTIFUL layered Valentine! Fabulous card and I always love your wildlife pictures!!!! Wow, wonderful Valentine card my friend, those colours are amazing and just look at all of those amazing layers. 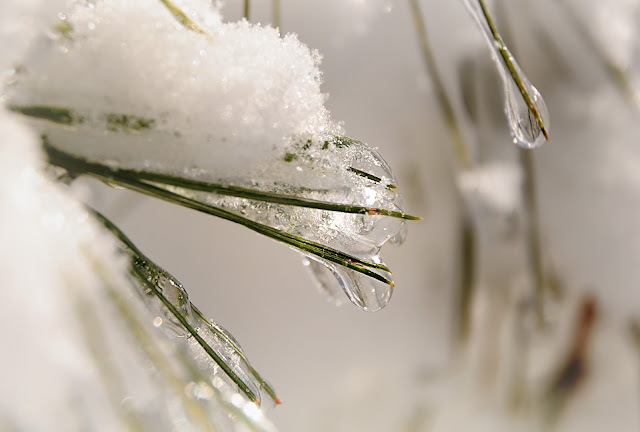 As always, your winter wonderland shots are truely stunning, you have an amazing eye for detail and composition. Beautiful card whit lovely papers ! Oh, so sad to hear that it's your last post for F&F, Pamellia! This Valentine card is a pure vintage perfection, my friend! Your cards are always masterpieces of art and this one is not an exception! I absolutely love this one! Breathtakingly beautiful nature and breathtakingly beautiful shots! You know that I am a big fan of your fantastic photography! What a treat for the eyes!